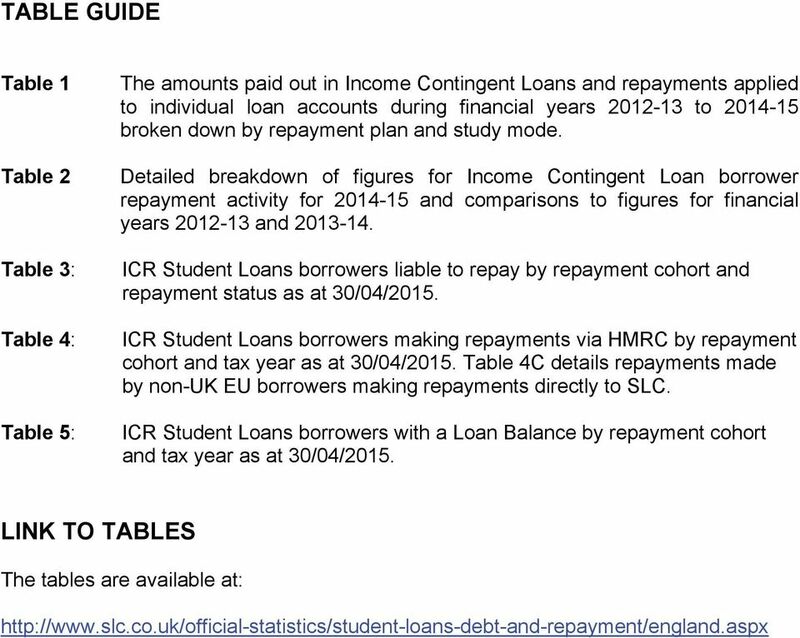 Download "STUDENT LOANS IN ENGLAND, FINANCIAL YEAR 2014-15 INTRODUCTION SLC SFR 01/2015. 18 June 2015. 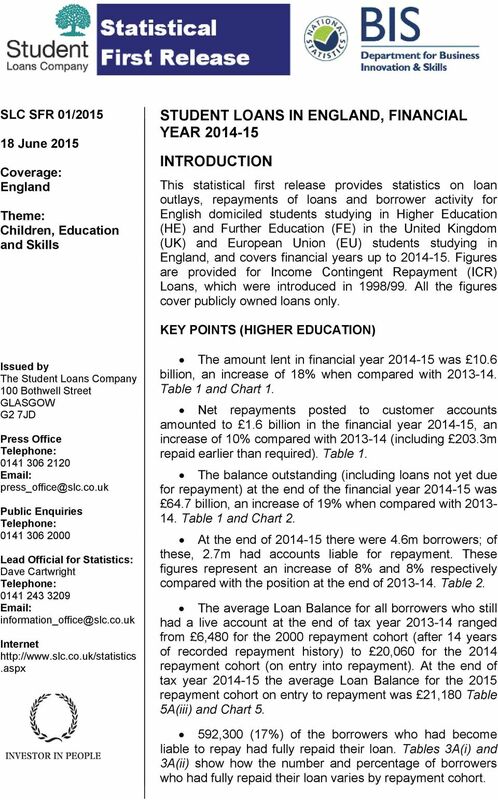 Coverage: England"
1 SLC SFR 01/ June 2015 Coverage: England Theme: Children, Education and Skills STUDENT LOANS IN ENGLAND, FINANCIAL YEAR INTRODUCTION This statistical first release provides statistics on loan outlays, repayments of loans and borrower activity for English domiciled students studying in Higher Education (HE) and Further Education (FE) in the United Kingdom (UK) and European Union (EU) students studying in England, and covers financial years up to Figures are provided for Income Contingent Repayment (ICR) Loans, which were introduced in 1998/99. All the figures cover publicly owned loans only. KEY POINTS (HIGHER EDUCATION) Issued by The Student Loans Company 100 Bothwell Street GLASGOW G2 7JD Press Office Telephone: Public Enquiries Telephone: Lead Official for Statistics: Dave Cartwright Telephone: Internet The amount lent in financial year was 10.6 billion, an increase of 18% when compared with Table 1 and Chart 1. Net repayments posted to customer accounts amounted to 1.6 billion in the financial year , an increase of 10% compared with (including 203.3m repaid earlier than required). Table 1. The balance outstanding (including loans not yet due for repayment) at the end of the financial year was 64.7 billion, an increase of 19% when compared with Table 1 and Chart 2. At the end of there were 4.6m borrowers; of these, 2.7m had accounts liable for repayment. These figures represent an increase of 8% and 8% respectively compared with the position at the end of Table 2. The average Loan Balance for all borrowers who still had a live account at the end of tax year ranged from 6,480 for the 2000 repayment cohort (after 14 years of recorded repayment history) to 20,060 for the 2014 repayment cohort (on entry into repayment). At the end of tax year the average Loan Balance for the 2015 repayment cohort on entry to repayment was 21,180 Table 5A(iii) and Chart ,300 (17%) of the borrowers who had become liable to repay had fully repaid their loan. Tables 3A(i) and 3A(ii) show how the number and percentage of borrowers who had fully repaid their loan varies by repayment cohort. 3 DEFINITIONS 24+ Advanced Learning Loan Account paid in full Balance transfers Cancelled loan Domicile In arrears Income Contingent Loan Income Threshold Liable to repay Losses through phishing A fee loan payable to Further Education (FE) providers on behalf of FE learners who meet the eligibility criteria and started a FE course on or after 1 st of August The borrower has repaid the account in full without it being cancelled or written off. It includes accounts with small balance write-offs of less than or equal to 5. Also includes accounts closed under the Repayment of Teacher Loans (RTL) Scheme. Transfers that can occur between different of loans. The borrower no longer has any liability to repay as provided for in the loans regulations. A borrower s liability shall be cancelled: On the death of the borrower; On reaching the age cancellation criteria for their loan (age 50, 60, 65 or after 25 years or 30 years depending on the type of loan and year taken out); or If borrower is in receipt of a disability related benefit and permanently unfit for work. The habitual and normal residence of a student apart from temporary or occasional absences in the relevant period prior to commencement of study. Borrowers who have at least one loan on which repayments are overdue. Arrears arise when a borrower moves overseas and fails to repay SLC according to their repayment schedule. Additionally any borrower who moves overseas and fails to provide the information required to agree the appropriate repayment schedule will also be placed in arrears. Also known as Income Contingent Repayment Loan. Introduced in 1998, repayment is 9% of income above the repayment threshold. Includes ICR maintenance loans, Tuition Fee Loans, hardship loans and part-time loans. Hardship loans and part-time loans ceased to be issued after academic year 2003/04. Tuition Fee Loans have been available to eligible part-time students from September 2012 and from 1 st August 2013 to eligible FE learners through 24+ Advanced Learning loans. The earnings level at which borrowers liable to repay will make repayments. The borrower has reached their Statutory Repayment Due Date (SRDD). See definition of SRDD. Losses through phishing are write offs for loan payments redirected by a fraudster that would otherwise have gone to a student. Phishing is a fraudulent attempt to obtain from customers information such as usernames, passwords and bank details by masquerading as a reliable entity in an electronic communication such as or instant messaging. If a student responds to the phishing , payments that would otherwise go to that student may be redirected by the fraudster. 4 Maintenance Loan New borrowers No live employment at Her Majesty s Revenue & Customs (HMRC) Non UK EU borrower Overdue Debt Maintenance loans are loans to cover living costs. Borrowers who had no loans at the beginning of the financial year and took out new loans during the financial year. Borrowers in the UK tax system where HMRC does not have a record of any current employment when the data cut is taken for the statistics, therefore their latest employment status is given as to be determined A borrower who was originally domiciled in an EU country prior to entering higher education in England. Such borrowers are eligible from academic year 2006/07 and for Tuition Fee Loan only. That part of the Loan Balance that is overdue for those borrowers who are in arrears. Part Time Loans New part-time students starting courses from September 2012 onwards at publicly funded universities and colleges are subject to tuition fees of up to 6,750 per year. This group of students are entitled to apply for an up-front fee loan to meet the full costs of their tuition (or up to 4,500 towards their tuition for courses at privately funded universities and colleges). Refunds of income contingent repayments Repayment Cohort Repayment Plan Study Mode Statutory Repayment Due Date (SRDD) Tuition Fee Loan Written off loan Where over-repayment is identified, a refund is provided to the customer by SLC. A borrower is placed in a single repayment cohort. In some circumstances the repayment cohort may change, i.e. withdrawal from course of study. The repayment cohort is based on the year of the earliest Statutory Repayment Due Date (SRDD). See definition of SRDD below. From 1 September 2012, the ICR Loan scheme has been separated into two different repayment arrangements called Repayment Plan 1 and Repayment Plan 2. They differ in the earnings threshold used to trigger repayment and the interest rate applied to outstanding balances. The Repayment Plan 1 is applicable to students who started their course before 1 st September 2012 while Repayment Plan 2 is applicable to students who started their course from 1 st September 2012 onwards. The mode of study (full-time or part-time) when the borrower took out their loan. The point a borrower becomes liable to begin repaying a loan, the April after graduating or otherwise leaving their course. After the SRDD borrowers are required to make repayments if their income is above the threshold. Tuition Fee Loans are loans to cover all or part of the cost of tuition. They are paid directly to the Learning Provider. The borrower remains liable to repay but recovery is deemed unlikely by the loan administrator or not possible by legal judgement. From April 2010, student loans are exempt from Individual Voluntary Arrangements (IVA). 5 STATISTICAL COMMENTARY Chart 1 Total amount lent in HE in financial years to ,828.3 million , , , ,325.5 Tuition Fee Loan Maintenance Loan , , , , , Financial Years The total amount lent in financial year was 10.6 billion, which is an increase of 18% when compared with financial year Chart 2 70,000 60,000 Total balance of HE income contingent student loans at the end of financial years to , , ,000 20, , , , , ,776.8 Non UK EU domicile England domicile 10, Financial Year The total Loan Balance at the end of financial year is 64.7 billion, which is an increase of 19% when compared with At this point in time the new lending and the interest added outweighs the repayments being made by those borrowers who are now liable to repay. 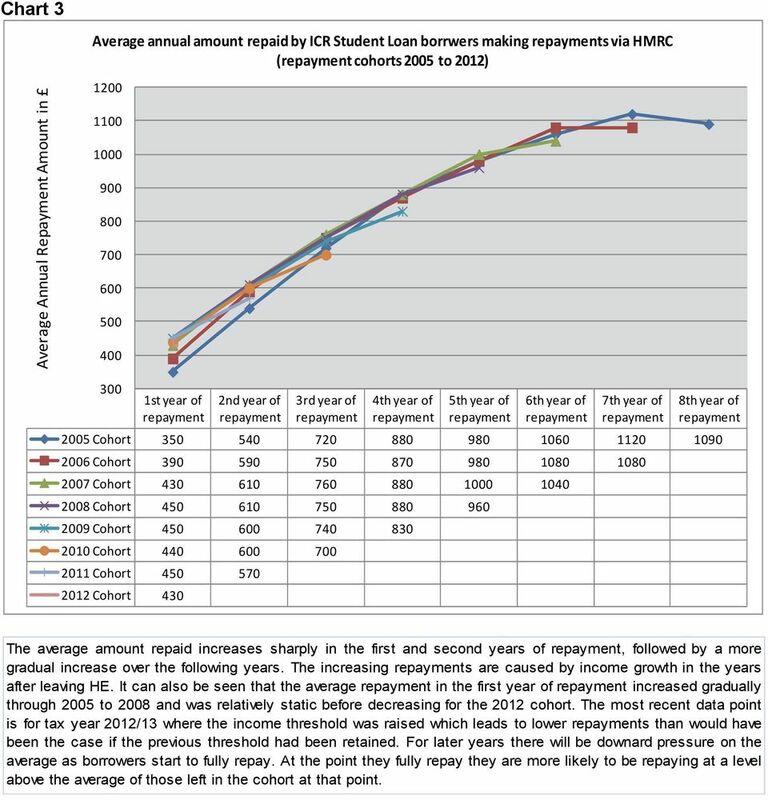 6 Chart 3 Average annual amount repaid by ICR Student Loan borrwers making repayments via HMRC (repayment cohorts 2005 to 2012) Average Annual Repayment Amount in st year of repayment 2nd year of repayment 3rd year of repayment 4th year of repayment 5th year of repayment 6th year of repayment 7th year of repayment 8th year of repayment 2005 Cohort Cohort Cohort Cohort Cohort Cohort Cohort Cohort 430 The average amount repaid increases sharply in the first and second years of repayment, followed by a more gradual increase over the following years. The increasing repayments are caused by income growth in the years after leaving HE. It can also be seen that the average repayment in the first year of repayment increased gradually through 2005 to 2008 and was relatively static before decreasing for the 2012 cohort. The most recent data point is for tax year 2012/13 where the income threshold was raised which leads to lower repayments than would have been the case if the previous threshold had been retained. For later years there will be downard pressure on the average as borrowers start to fully repay. At the point they fully repay they are more likely to be repaying at a level above the average of those left in the cohort at that point. 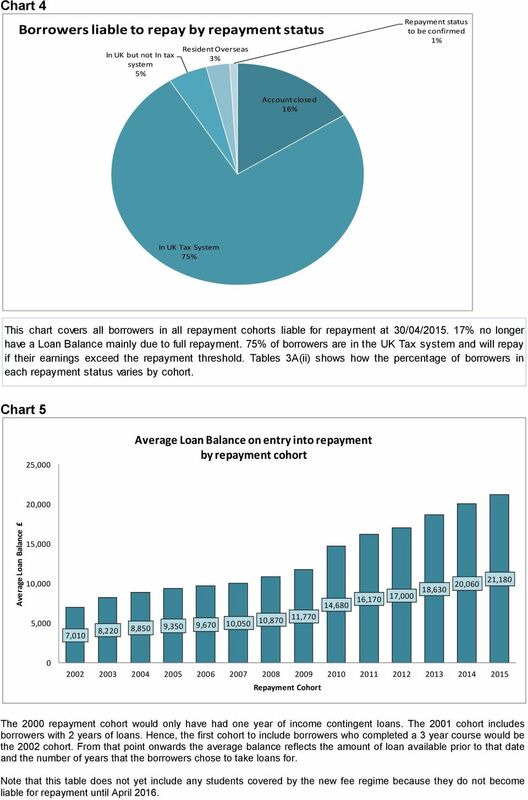 7 Chart 4 Borrowers liable to repay by repayment status In UK but not In tax system 5% Resident Overseas 3% Repayment status to be confirmed 1% Account closed 16% In UK Tax System 75% This chart covers all borrowers in all repayment cohorts liable for repayment at 30/04/ % no longer have a Loan Balance mainly due to full repayment. 75% of borrowers are in the UK Tax system and will repay if their earnings exceed the repayment threshold. 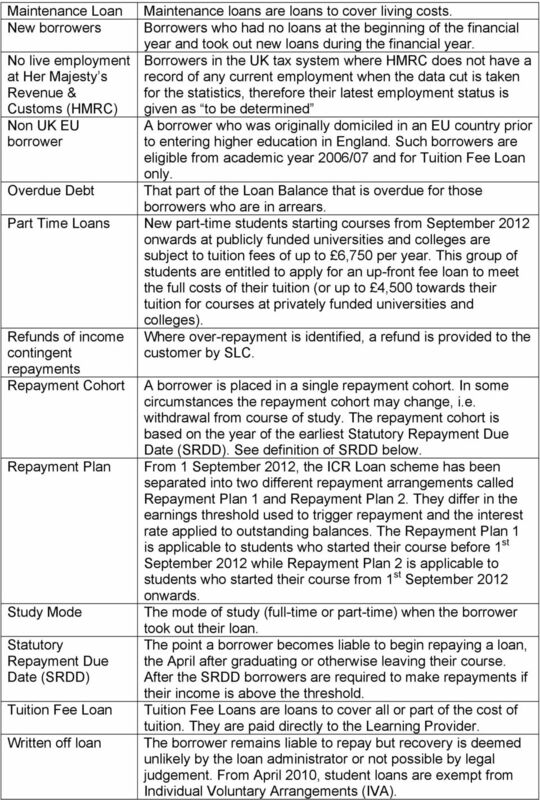 Tables 3A(ii) shows how the percentage of borrowers in each repayment status varies by cohort. Chart 5 25,000 Average Loan Balance on entry into repayment by repayment cohort 20,000 Average Loan Balance 15,000 10,000 5,000 7,010 8,220 8,850 9,350 9,670 10,050 10,870 11,770 14,680 16,170 17,000 18,630 20,060 21, Repayment Cohort The 2000 repayment cohort would only have had one year of income contingent loans. The 2001 cohort includes borrowers with 2 years of loans. Hence, the first cohort to include borrowers who completed a 3 year course would be the 2002 cohort. From that point onwards the average balance reflects the amount of loan available prior to that date and the number of years that the borrowers chose to take loans for. Note that this table does not yet include any students covered by the new fee regime because they do not become liable for repayment until April 2016. 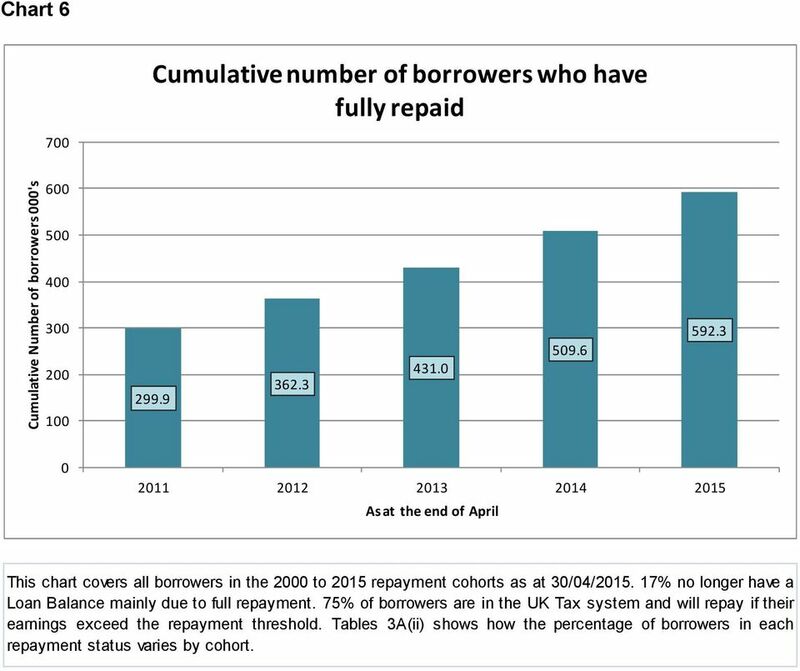 8 Chart 6 Cumulative number of borrowers who have fully repaid 700 Cumulative Number of borrowers 000's As at the end of April This chart covers all borrowers in the 2000 to 2015 repayment cohorts as at 30/04/ % no longer have a Loan Balance mainly due to full repayment. 75% of borrowers are in the UK Tax system and will repay if their earnings exceed the repayment threshold. Tables 3A(ii) shows how the percentage of borrowers in each repayment status varies by cohort. 9 DATA SOURCES 1. This publication uses data from a single source: administrative data from the SLC Customer Ledger Account Servicing System (CLASS). For details of the administrative sources see the published Statement of administrative sources published on the SLC website using the following link _statement_of_administrative_sources.pdf DATA QUALITY 2. 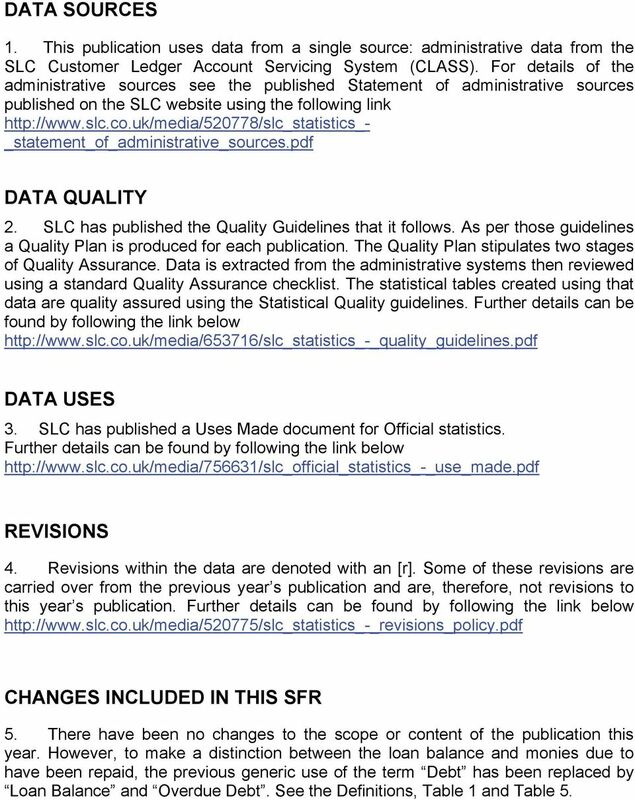 SLC has published the Quality Guidelines that it follows. As per those guidelines a Quality Plan is produced for each publication. The Quality Plan stipulates two stages of Quality Assurance. Data is extracted from the administrative systems then reviewed using a standard Quality Assurance checklist. The statistical tables created using that data are quality assured using the Statistical Quality guidelines. Further details can be found by following the link below DATA USES 3. 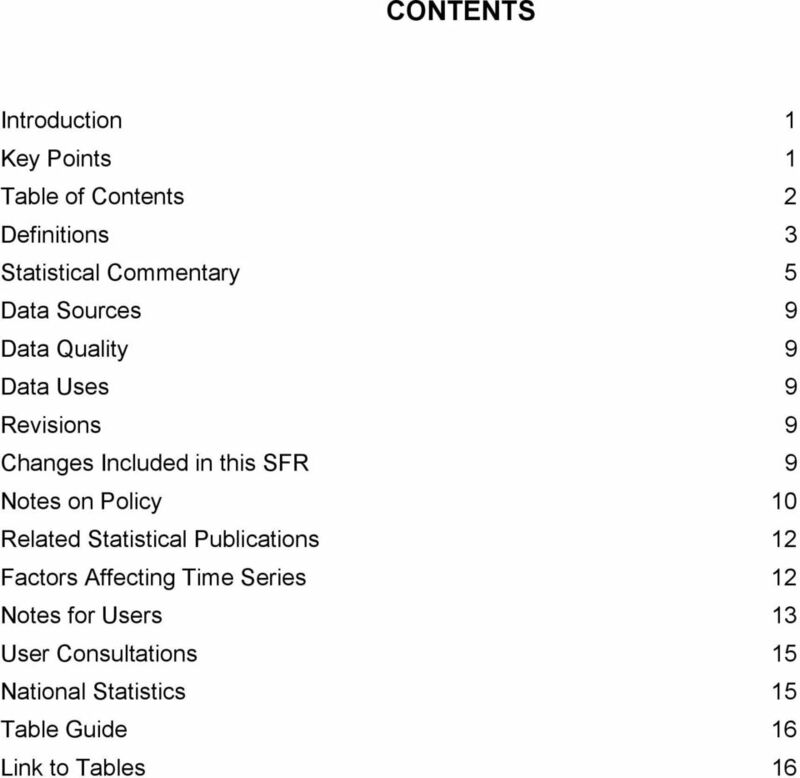 SLC has published a Uses Made document for Official statistics. Further details can be found by following the link below REVISIONS 4. Revisions within the data are denoted with an [r]. Some of these revisions are carried over from the previous year s publication and are, therefore, not revisions to this year s publication. Further details can be found by following the link below CHANGES INCLUDED IN THIS SFR 5. There have been no changes to the scope or content of the publication this year. However, to make a distinction between the loan balance and monies due to have been repaid, the previous generic use of the term Debt has been replaced by Loan Balance and Overdue Debt. See the Definitions, Table 1 and Table 5. 10 NOTES ON POLICY ELIGIBILITY 6. Student loans are available to eligible full-time undergraduate students and those taking full-time or part-time postgraduate initial teacher training courses. 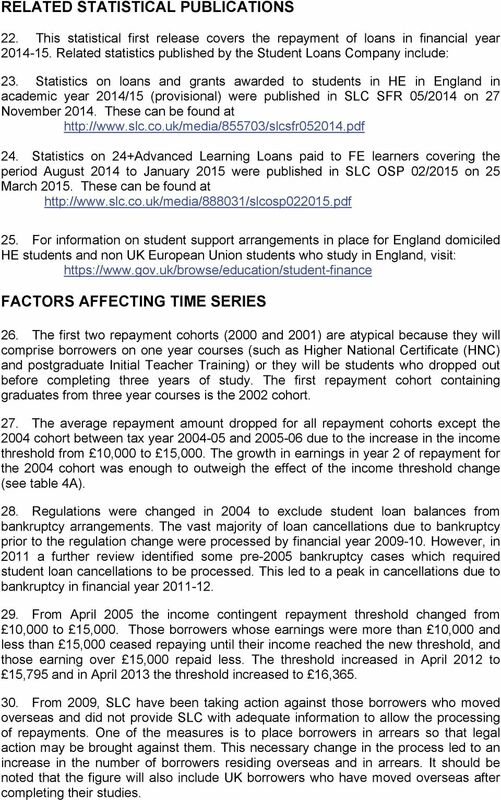 From 2000/01 part-time loans were available, but were then replaced by part-time course grants and part-time fee grants. Tuition Fee Loans have been available to eligible part-time undergraduate students from September Tuition Fee Loans have been available to eligible FE learners through 24+ Advanced Learning loans from August REPAYMENT OF INCOME CONTINGENT LOANS 7. Repayments are mainly repaid through the UK taxation system, and are repaid once the borrower is earning over the relevant repayment threshold. The amount is deducted by the employer at the rate of 9% over the threshold or by HMRC through Self-Assessment borrowers. After the tax year is over the employers pass details of repayments per borrower to HMRC in P14 returns. 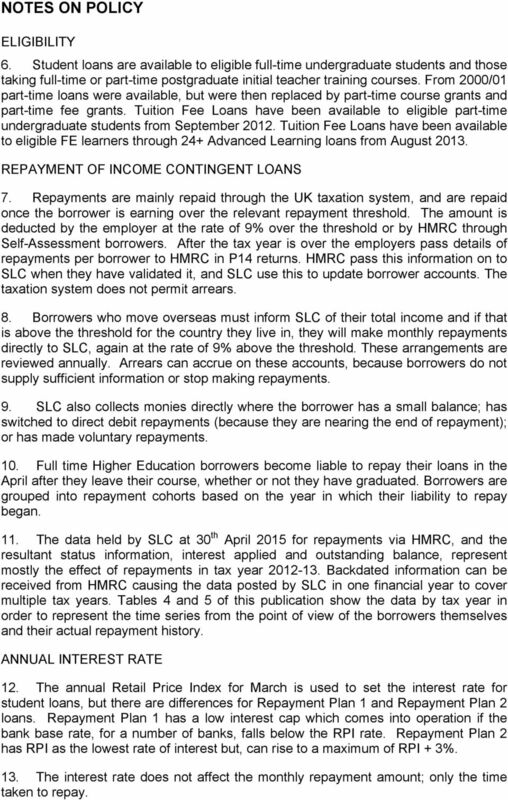 HMRC pass this information on to SLC when they have validated it, and SLC use this to update borrower accounts. The taxation system does not permit arrears. 8. Borrowers who move overseas must inform SLC of their total income and if that is above the threshold for the country they live in, they will make monthly repayments directly to SLC, again at the rate of 9% above the threshold. These arrangements are reviewed annually. Arrears can accrue on these accounts, because borrowers do not supply sufficient information or stop making repayments. 9. SLC also collects monies directly where the borrower has a small balance; has switched to direct debit repayments (because they are nearing the end of repayment); or has made voluntary repayments. 10. Full time Higher Education borrowers become liable to repay their loans in the April after they leave their course, whether or not they have graduated. Borrowers are grouped into repayment cohorts based on the year in which their liability to repay began. 11. The data held by SLC at 30 th April 2015 for repayments via HMRC, and the resultant status information, interest applied and outstanding balance, represent mostly the effect of repayments in tax year Backdated information can be received from HMRC causing the data posted by SLC in one financial year to cover multiple tax years. Tables 4 and 5 of this publication show the data by tax year in order to represent the time series from the point of view of the borrowers themselves and their actual repayment history. ANNUAL INTEREST RATE 12. The annual Retail Price Index for March is used to set the interest rate for student loans, but there are differences for Repayment Plan 1 and Repayment Plan 2 loans. Repayment Plan 1 has a low interest cap which comes into operation if the bank base rate, for a number of banks, falls below the RPI rate. 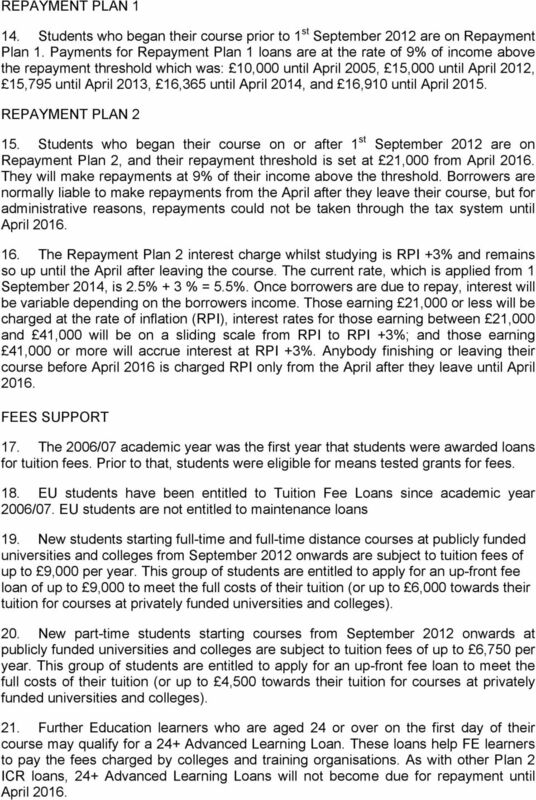 Repayment Plan 2 has RPI as the lowest rate of interest but, can rise to a maximum of RPI + 3%. 13. The interest rate does not affect the monthly repayment amount; only the time taken to repay. 11 REPAYMENT PLAN Students who began their course prior to 1 st September 2012 are on Repayment Plan 1. Payments for Repayment Plan 1 loans are at the rate of 9% of income above the repayment threshold which was: 10,000 until April 2005, 15,000 until April 2012, 15,795 until April 2013, 16,365 until April 2014, and 16,910 until April REPAYMENT PLAN Students who began their course on or after 1 st September 2012 are on Repayment Plan 2, and their repayment threshold is set at 21,000 from April They will make repayments at 9% of their income above the threshold. Borrowers are normally liable to make repayments from the April after they leave their course, but for administrative reasons, repayments could not be taken through the tax system until April The Repayment Plan 2 interest charge whilst studying is RPI +3% and remains so up until the April after leaving the course. The current rate, which is applied from 1 September 2014, is 2.5% + 3 % = 5.5%. Once borrowers are due to repay, interest will be variable depending on the borrowers income. Those earning 21,000 or less will be charged at the rate of inflation (RPI), interest rates for those earning between 21,000 and 41,000 will be on a sliding scale from RPI to RPI +3%; and those earning 41,000 or more will accrue interest at RPI +3%. Anybody finishing or leaving their course before April 2016 is charged RPI only from the April after they leave until April FEES SUPPORT 17. The 2006/07 academic year was the first year that students were awarded loans for tuition fees. Prior to that, students were eligible for means tested grants for fees. 18. EU students have been entitled to Tuition Fee Loans since academic year 2006/07. EU students are not entitled to maintenance loans 19. New students starting full-time and full-time distance courses at publicly funded universities and colleges from September 2012 onwards are subject to tuition fees of up to 9,000 per year. This group of students are entitled to apply for an up-front fee loan of up to 9,000 to meet the full costs of their tuition (or up to 6,000 towards their tuition for courses at privately funded universities and colleges). 20. New part-time students starting courses from September 2012 onwards at publicly funded universities and colleges are subject to tuition fees of up to 6,750 per year. This group of students are entitled to apply for an up-front fee loan to meet the full costs of their tuition (or up to 4,500 towards their tuition for courses at privately funded universities and colleges). 21. Further Education learners who are aged 24 or over on the first day of their course may qualify for a 24+ Advanced Learning Loan. These loans help FE learners to pay the fees charged by colleges and training organisations. As with other Plan 2 ICR loans, 24+ Advanced Learning Loans will not become due for repayment until April 2016. 12 RELATED STATISTICAL PUBLICATIONS 22. This statistical first release covers the repayment of loans in financial year Related statistics published by the Student Loans Company include: 23. 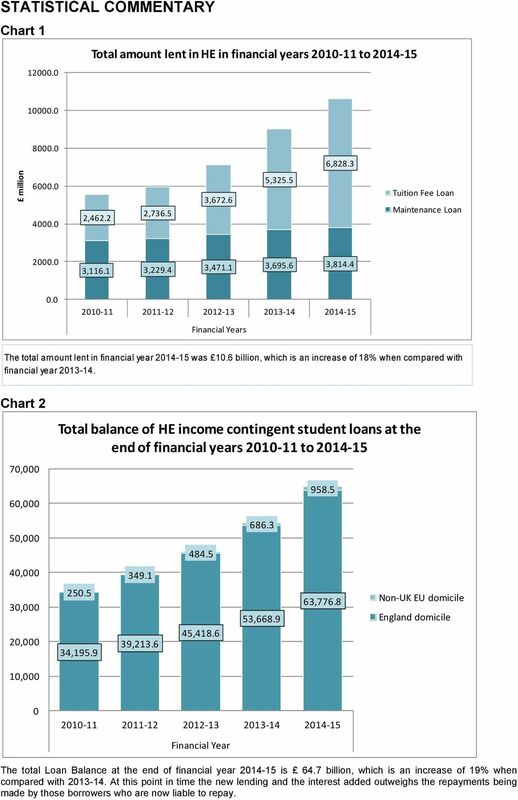 Statistics on loans and grants awarded to students in HE in England in academic year 2014/15 (provisional) were published in SLC SFR 05/2014 on 27 November These can be found at Statistics on 24+Advanced Learning Loans paid to FE learners covering the period August 2014 to January 2015 were published in SLC OSP 02/2015 on 25 March These can be found at For information on student support arrangements in place for England domiciled HE students and non UK European Union students who study in England, visit: FACTORS AFFECTING TIME SERIES 26. The first two repayment cohorts (2000 and 2001) are atypical because they will comprise borrowers on one year courses (such as Higher National Certificate (HNC) and postgraduate Initial Teacher Training) or they will be students who dropped out before completing three years of study. The first repayment cohort containing graduates from three year courses is the 2002 cohort. 27. The average repayment amount dropped for all repayment cohorts except the 2004 cohort between tax year and due to the increase in the income threshold from 10,000 to 15,000. The growth in earnings in year 2 of repayment for the 2004 cohort was enough to outweigh the effect of the income threshold change (see table 4A). 28. Regulations were changed in 2004 to exclude student loan balances from bankruptcy arrangements. The vast majority of loan cancellations due to bankruptcy prior to the regulation change were processed by financial year However, in 2011 a further review identified some pre-2005 bankruptcy cases which required student loan cancellations to be processed. This led to a peak in cancellations due to bankruptcy in financial year From April 2005 the income contingent repayment threshold changed from 10,000 to 15,000. Those borrowers whose earnings were more than 10,000 and less than 15,000 ceased repaying until their income reached the new threshold, and those earning over 15,000 repaid less. The threshold increased in April 2012 to 15,795 and in April 2013 the threshold increased to 16, From 2009, SLC have been taking action against those borrowers who moved overseas and did not provide SLC with adequate information to allow the processing of repayments. One of the measures is to place borrowers in arrears so that legal action may be brought against them. This necessary change in the process led to an increase in the number of borrowers residing overseas and in arrears. It should be noted that the figure will also include UK borrowers who have moved overseas after completing their studies. 13 31. The 2010 cohort of EU borrowers is the first significant group of EU borrowers who have come into repayment, comprising mainly of 2006/07 entrants on three year courses. The 2011 and 2012 cohorts include some 2006/07 entrants on longer courses, as well as those who started their 3 year degree courses in 2007/08 and 2008/09 respectively. Academic Year 2006/07 was the first year that non-uk EU domiciled students could be awarded tuition fee student loans, therefore EU borrowers in repayment cohorts prior to 2010 will mostly comprise of those borrowers on one or two year courses or those who have dropped out of their course. 32. Regulations were changed in 2010 to exclude Student Loans balances from Individual Voluntary Agreement (IVA) arrangements. A review of the IVA case list in 2011 identified a backlog of customers who have complied with their IVA arrangements i.e. completed reduced repayments over a 5 or 6 year period. This led to a peak in the student loan write off due to IVA arrangements in financial year There will continue to be further write off of loans for IVA customers who complete their IVA repayment schedules (set up before 2010) over future years. 33. The first year of the new support arrangements where tuition fees of 9,000 could be charged was academic year 2012/13, which straddled financial years and Repayments through the tax system will not commence for Repayment Plan 2 borrowers until April 2016, although borrowers may repay directly to the SLC at any time if they choose to do so. 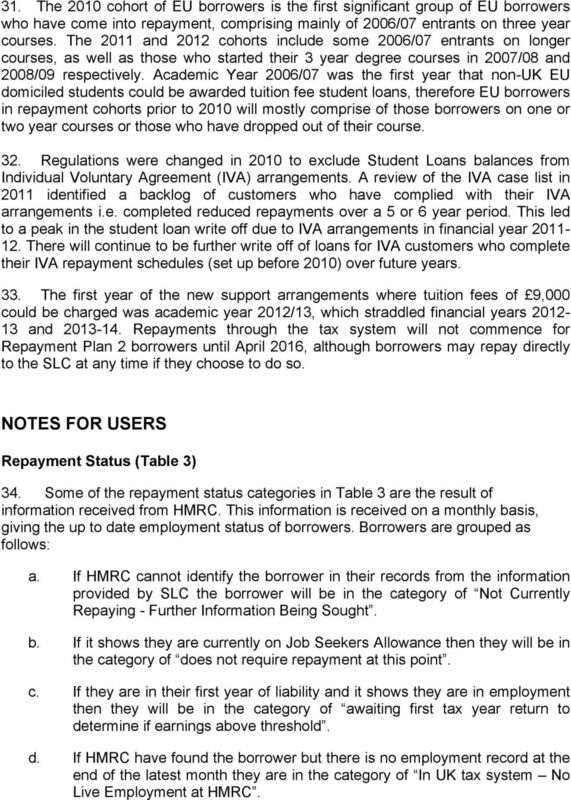 NOTES FOR USERS Repayment Status (Table 3) 34. Some of the repayment status categories in Table 3 are the result of information received from HMRC. This information is received on a monthly basis, giving the up to date employment status of borrowers. Borrowers are grouped as follows: a. If HMRC cannot identify the borrower in their records from the information provided by SLC the borrower will be in the category of Not Currently Repaying - Further Information Being Sought. b. If it shows they are currently on Job Seekers Allowance then they will be in the category of does not require repayment at this point. c. If they are in their first year of liability and it shows they are in employment then they will be in the category of awaiting first tax year return to determine if earnings above threshold. d. If HMRC have found the borrower but there is no employment record at the end of the latest month they are in the category of In UK tax system No Live Employment at HMRC. 14 e. Once the borrower has been in the tax system for one tax year HMRC will be able to pass on returns from the borrower s employer(s) to show if the borrower is above or below the earnings threshold for repayment. HMRC notify SLC of repayments deducted by employers during a year once employers provide those details to HMRC on their annual returns after the end of the tax year. So it is only when that happens, that SLC will know if a borrower has been above or below the earnings threshold. The borrower will then be shown in the appropriate category. f. However, if the borrower has ceased to have an employment record they will revert to being in In UK tax system No Live Employment at HMRC 35. The profile of EU borrowers is different to that of UK national borrowers for a number of reasons: firstly only those who have worked in the UK will have a National Insurance Number; secondly they are more likely to go overseas after HE than are UK national borrowers. Although the profiles are different it should be noted that the majority of borrowers who are known to be resident overseas are UK nationals. 36. The 2010 repayment cohort contains the first significant group of EU tuition fee loan borrowers. The group will predominantly comprise of the 2006/07 entrants who have completed three year courses. EU borrowers in earlier repayment cohorts will mostly comprise of those borrowers on one or two year courses or those who left their courses early. 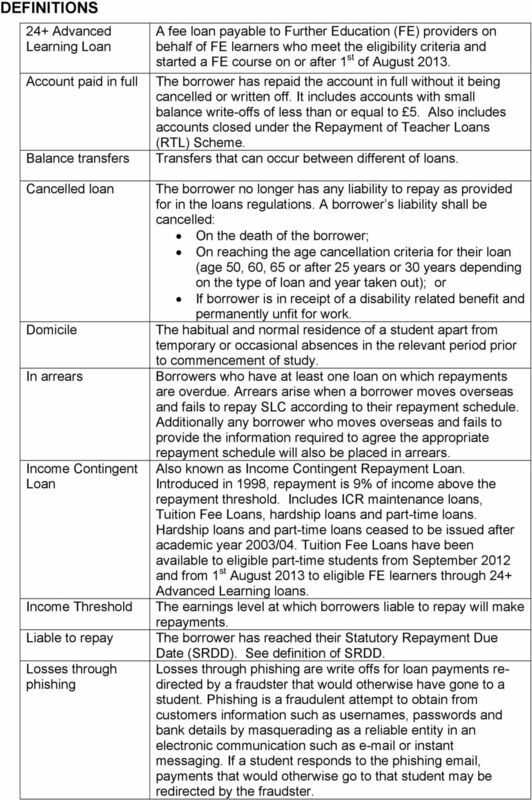 Repayments made directly to SLC by EU borrowers (Table 4C) 37. 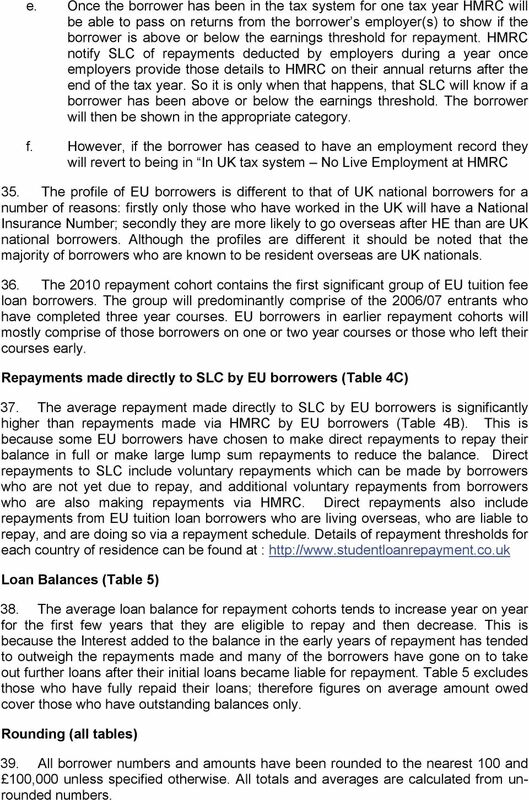 The average repayment made directly to SLC by EU borrowers is significantly higher than repayments made via HMRC by EU borrowers (Table 4B). This is because some EU borrowers have chosen to make direct repayments to repay their balance in full or make large lump sum repayments to reduce the balance. Direct repayments to SLC include voluntary repayments which can be made by borrowers who are not yet due to repay, and additional voluntary repayments from borrowers who are also making repayments via HMRC. Direct repayments also include repayments from EU tuition loan borrowers who are living overseas, who are liable to repay, and are doing so via a repayment schedule. Details of repayment thresholds for each country of residence can be found at : Loan Balances (Table 5) 38. The average loan balance for repayment cohorts tends to increase year on year for the first few years that they are eligible to repay and then decrease. This is because the Interest added to the balance in the early years of repayment has tended to outweigh the repayments made and many of the borrowers have gone on to take out further loans after their initial loans became liable for repayment. Table 5 excludes those who have fully repaid their loans; therefore figures on average amount owed cover those who have outstanding balances only. Rounding (all tables) 39. All borrower numbers and amounts have been rounded to the nearest 100 and 100,000 unless specified otherwise. All totals and averages are calculated from unrounded numbers. 15 USER CONSULTATIONS 40. Consultation exercises are conducted by SLC on the Official Statistics it produces in order to understand who uses the publications, for what purpose, and to find out how they can be made more useful in terms of content, methodology, timeliness and presentation. As part of the consultation process SLC runs surveys. 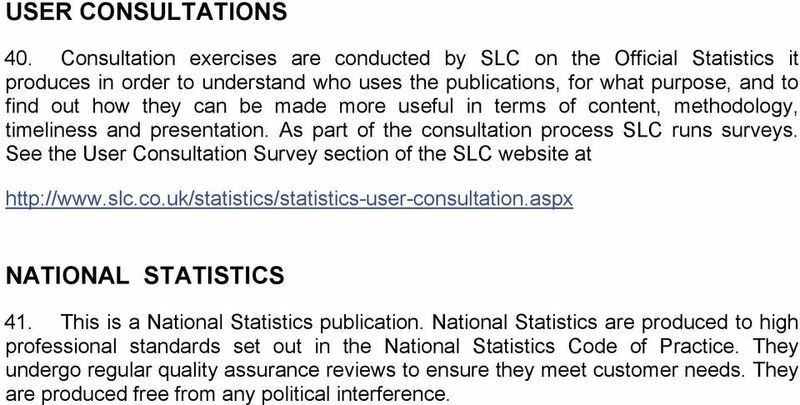 See the User Consultation Survey section of the SLC website at NATIONAL STATISTICS 41. This is a National Statistics publication. National Statistics are produced to high professional standards set out in the National Statistics Code of Practice. They undergo regular quality assurance reviews to ensure they meet customer needs. They are produced free from any political interference. 24+ Advanced Learning Loans are being introduced by the Government for learners aged 24 and over studying at level 3 and above from 1 August 2013. Q: How much will my tuition fees cost? A: From September 2012, universities and colleges of higher education in Wales as well as England can charge up to a maximum of 9,000 a year for their full-time courses. Report by the Comptroller and Auditor General Department for Business, Innovation & Skills Student loan repayments HC 818 SESSION 2013-14 28 NOVEMBER 2013 Our vision is to help the nation spend wisely. A guide to financial support for full-time students in higher education 2014/15 CONTENTS WHAT IS STUDENT FINANCE? 1 DO I QUALIFY? 2 WHAT CAN I GET? 4 ADDITIONAL OR SUPPLEMENTARY SUPPORT 13 HOW DO I APPLY? Student Finance Wales (SFW) Developments Steve Nicholls, Head of Student Finance Operations www.studentfinancewales.co.